Celebrity Flora is the first ship of its kind to be designed and built specifically with the destination in mind. Every space, including the all-suites accommodations, features Celebrity's innovative outward-facing concept, so the destination is always the center of attention at every turn, offering 360-degree views of the islands. 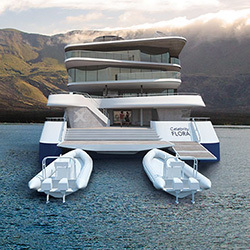 By using natural materials inspired by the islands, Celebrity has created a ship that's a true complement to the destination and merges seamlessly with the surroundings to create a greater connection between you, the ocean, and the breathtaking islands. One of the most energy-efficient ships of its size in the diverse archipelago, the 100-guest Celebrity Flora offers seamless sea-to-shore transportation, and includes anchorless technology that maintains the ships position while protecting the sensitive sea floor. It is one of the most eco-friendly and environmentally safe ships sailing the planet. Personal suite attendants, new dining venues, an open-air stargazing platform, and expert-led ecological seminars round out the modern luxury vacation experience. Daphne Island - Daphne is a satellite volcanic cone located north of Santa Cruz Island. The crater floor is an important breeding site for blue-footed boobies. The cliff shore of the island is home for sea lions, pelicans, blue-footed boobies, and tropical birds which can be observed during the circumnavigation of the island. Elizabeth Bay, Isabela Island - Elizabeth Bay is one of the furthest points in the Galapagos visited on our cruise. Enter a sheltered cove accessible only by Zodiac. It is a wonderful and secluded mangrove ecosystem that is a refuge, resting, and feeding site for sea turtles, rays, blue-footed boobies, flightless cormorants, penguins, pelicans, lava herons, and more. Excursion options: Zodiac. Tagus Cove, Isabela Island - Historically an anchorage for pirates and whalers, this site offers a breathtaking view of Isabela, its volcanoes, and a saltwater lagoon. Along the shore, seabirds, penguins, sea lions, sea turtles, and nesting flightless cormorants can often be found. Excursion options: Zodiac, walk, snorkeling. Sullivan Bay, Santiago Island - During a volcanic eruption in the early 1900's, this area of Santiago was covered with flowing lava. Today, the hardened fields of black rock create a geologic wonderland. There are two small beaches where turtles come for nesting. Take advantage of the cool of the early morning for a walk at this amazing site. Excursion options: Walk. Bartolomé Island - Bartolomé Island offers one of the region's most photographed views, and is a spectacular geological setting. Its barren moon-like volcanic landscapes, spatter cones, and pinnacle rock make for a unique stop. It is also home to the endemic Galapagos penguin and provides an excellent opportunity for snorkeling. Marine turtles come ashore to nest here between January and March. Excursion options: hike up some 368 stairs "To the Top" of the volcano, a zodiac ride, and an optional beach swim or snorkel. Las Bachas, Santa Cruz Island - Las Bachas is one of the most beautiful white sand beaches in the Galapagos. Behind it are two small ponds that often have flamingos feeding in the shallows. It is also one of the largest nesting areas for the Pacific green sea turtle. Excursion options: short beach walk to look for flamingos, followed by an optional opportunity to swim, snorkel from the beach, or just relax on the shore. North Seymour Island - A small island just north of Baltra, North Seymour is home to the largest colony of frigate birds in the Galapagos. While keeping an eye out for male frigates trying to impress potential mates with an inflated red neck pouch, you may also see blue-footed boobies dancing in a timeless courtship ritual. Sea lions and large land iguanas also roam about this rocky terrain. Excursion options: a long rocky walk, zodiac ride and short easy walk; or simply a scenic zodiac tour along the coast to view wildlife and the geology of the area. Experienced snorkelers will also have an option of deep water snorkeling. Punta Pitt, San Cristobal Island - After disembarking onto the small green sand beach, hike up to a plateau, where the view and landscape are so spectacular it is well worth the effort. A steep gully leads up the cliff to a breeding ground for all three varieties of boobies: Red-footed, Blue-footed and Nazca. It's the only place in the Galapagos where you can see all three species nesting together. Excursions options: Hike, kayak, snorkel, Zodiac. Puerto Baquerizo Moreno, San Cristobal Island - Visit the small waterfront town of Puerto Baquerizo Moreno, the administrative capital of the islands. Excursion options: a tour of a local interpretation center and time for shopping or a fast-paced long walk to view scenic vistas, followed by a visit to the interpretation center. Enjoy the morning on your own. Around noon, your guide will pick you up to start the afternoon tour with a culinary twist. You will visit Surquillo, the local food market, enjoy lunch at one of Lima's gourmet restaurants, and visit the Bohemian district of Barranco. After lunch, learn how to make traditional cocktails at a mixology class in a trendy Lima spot. Arrive back at the hotel in the late afternoon. Dinner and overnight at the Westin Lima. After your day at Machu Picchu, enjoy welcoming aperitifs, dinner, and an excellent selection of wines while relaxing on the Belmond Hiram Bingham luxury train back to Cusco for an evening of local music, dancing, and Pisco sours. Overnight at Hotel Monasterio in Cusco. 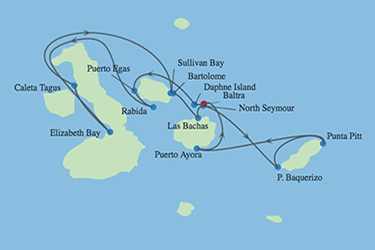 2 nights accommodation in Quito, a 7 night cruise and 7 nights in Peru including all air/land transfers, round-trip cruise from Isla Baltra and calling on Daphne, Puerto Egas, Rabida, Elizabeth Bay, Caleta Tagus, Sullivan Bay, Bartolome, Las Bachas, North Seymour, Puerto Baquerizo, Punta Pitt, and Puerto Ayora.